Meet the local architect with ties to the late spiritual leader Bhagwan Shree Rajneesh, popularized in the recent Netflix docuseries Wild Wild Country. Dallas architect Ajay Kothari recalls his 1977 family vacation to India with postcard clarity. On the itinerary: meeting spiritual leader Bhagwan Shree Rajneesh at his commune in Pune—a bucket-list request from his father. Kothari, then 17 and living with his family in Kenya, was up for the pilgrimage, too, having observed meditation techniques with his dad since age 14. “The influence was seeping in without my awareness,” he says. For those who haven’t yet binge-watched the critically lauded Netflix docuseries Wild Wild Country, here’s a quick rundown. The bearded Bhagwan, the controversial luminary later renamed Osho, relocated his commune to a barren ranch outside Antelope, Oregon, in 1981 with the idea of creating a fully sustainable, utopian city large enough to support an influx of 7,000 orange-robed followers. His one-time secretary, Ma Anand Sheela, was responsible for overseeing the development of the new city of Rajneeshpuram, which included creating infrastructure—housing, roads, power, airstrips, restaurants and retail—as well as cultivating the desert earth into farmable land for crops. “I was the only kid in the room and the youngest to be placed in a group,” he says. His father made arrangements for his son to extend his trip, and at the conclusion of the intense, four-day spiritual prescription—a process Kothari likens to peeling an onion—he met again with Bhagwan and experienced his first glimpse of “complete blissful silence,” or a satori. A few days turned into two months of meditations, workshops, and morning discourses presented by Bhagwan, which culminated in Kothari’s exit darshan, a meeting with the master. The high school student received his next assignment: to run a meditation center back in his hometown of Nairobi. Kothari did, and, two years later, he returned to Pune to meet with Bhagwan and received his sannyasin name: Swami Ajay Bharti. He has even bigger plans for raising the collective consciousness. Over the next 18 months, the Sava Holdings principal will capitalize on his expertise used in designing and developing boutique hotels (he co-owns Aloft in downtown Dallas and Richardson, Element at DFW Airport, Four Points by Sheraton in Coppell, and others) to create micro-meditation resorts in the United States and abroad, tentatively called Footprints of Consciousness, A Meditation and Celebration Resort. Programming will be flavored by the arts and science-based techniques. Environmentally friendly, modernist pods will serve as stylish lodging for guests seeking enlightenment 2.0. For more information, visit facebook.com/oshomeditationdallas. 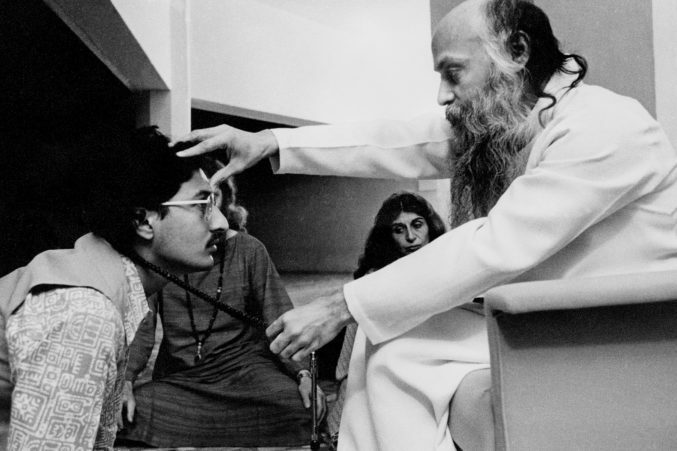 Bhagwan Shree Rajneesh in 1977. Where locals can go to re-center. Certified yoga instructor and Ayurveda expert Douchka Lecot, one of the co-founders of holistic workshop collective Yana Shala, performs individual water massage therapy sessions, a practice that is said to aid those with physical limitations, inflammation, stress, and acute pain. The water modality—“experiencing inner silence, like being in the womb”—is also meant to tap into deep-rooted emotions in a fluid way. At First United Lutheran Church on Mockingbird Lane, you are encouraged to dance like no one’s watching. Flail about for two hours to music from around the world (live and electronic). Founded by Monica Blossom, the format is a mix of moving meditation, self-expression, community, and sweat said to activate life force energy, joy, and inspiration. But don’t go looking for the bartender—this dance party is alcohol-free. Check out her website for a calendar of additional holistic happenings. The dynamic movement practice founded by Gabrielle Roth in the ’70s is now a worldwide community with a Dallas outpost led by certified 5Rhythms teacher Mati Vargas-Gibson. The practice, both a workout and a meditation, takes you through five movements—Flowing, Staccato, Chaos, Lyrical, and Stillness—said to help participants become attuned to patterns and express emotions and anxieties in a creative context.